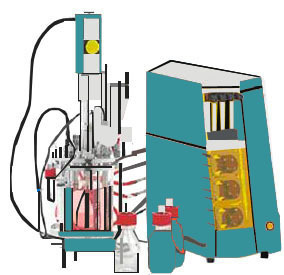 Roch Mechatronics Inc introduced world's best Fermentor/Bioreactor system suitable for a wide range of research, education and industrial applications. A number of easy-to-use, pre-configured versions are available for both microbial culture and cell culture. Microbial culture - growth of bacteria, yeast and fungi. Cell culture - growth of animal, insect and plant cells. Transition from shaker or tissue culture flask. Inclusive Notebook PC for operation and data storage. Interchangeable culture vessels with 1L, 2L or 5L working volume .